Hello! It's that time again, time for Lawn Fawn Inspiration Week! This month we continue to feature some of the new products released in February, today we are featuring the out of this world set Beam Me Up! I will be sharing more jar scapes this week that I created for the Lawn Fawn booth at Creativiation. 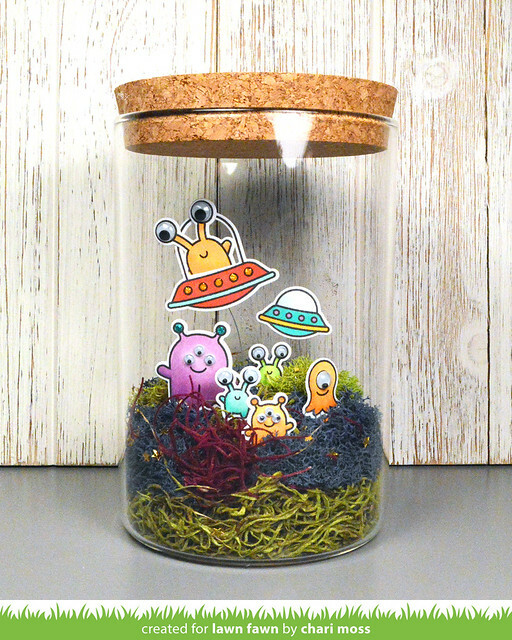 I had fun making this one with the different colored moss to create another planet and I sprinkled little gold star glitter around the bottom as well. 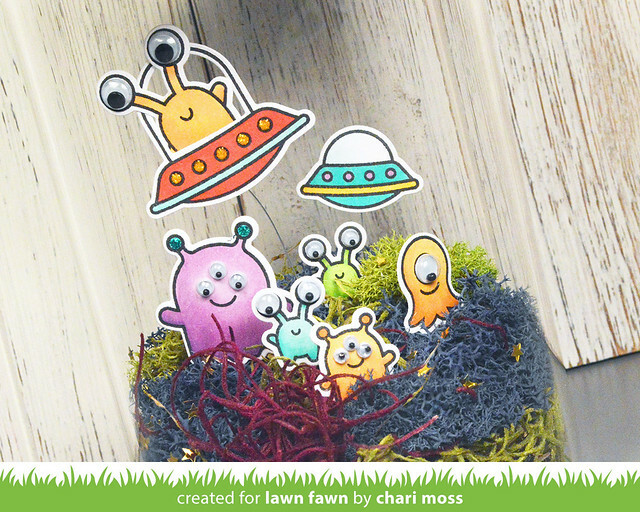 All the aliens are colored using Copic markers and cut out with the coordinating dies. I also added various sizes of googley eyes for some added fun. I really think they add an extra element of fun. The flying saucers are attached to thin wire inserted into the styrofoam below the moss and the aliens on the ground are arranged in the foam with toothpicks. Be sure to visit the new Lawn Fawn Blog for more projects using Beam Me Up! Oh my goodness this is super cute!! Adorable! Clever way to showcase a new set. Love it! the googley eyes really make it especially fun!